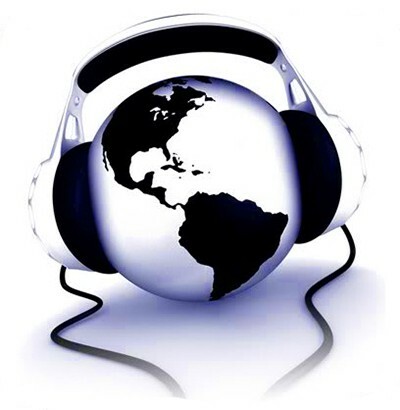 Every piece of music has an overall plan or structure, the “big picture”, so to speak. This is called the form of the music. It is easy to recognize the form or structure of something, like a cat or a leaf, if we can see it all at once. Other things, like the inside of a big building, or the structure of a government, may have to be explored or studied before their structure can be understood. You can’t hear a piece of music all at once; the best way to explore its form is to listen to it. Some pieces of music, like a building that is just one large room, only have to be explored once to understand their form. But other pieces are more like a building that is a maze of many rooms and hallways. Sometimes you may find yourself in a room you’ve seen before, other times in a room that’s new to you and yet seems familiar. These more complex pieces of music may have to be explored several times before you really understand their structure. 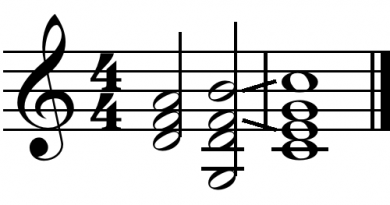 Musicians traditionally have two ways to describe the form of a piece of music. One way involves labelling each large section with a letter. The other way is to simply give a name to a form that is used a lot. Letters can be used to describe any form of music, whether it is used often or only rarely. Each major section of the music is labelled with a letter; for example, the first section is the A section. If the second section (or third or fourth) is exactly the same as the first, it is also labelled A. If it is very much like the A section, but with some important differences, it can be labelled A'(pronounced “A prime”). The A’ section can also show up later in the piece, or yet another variation of A, A” (pronounced “A double prime”) can show up, and so on. The first major section of the piece that is quite different from A is labelled B, and other sections that are like it can be labelled B, B’, B”, and so on. Sections that are not like A or B are labelled C, and so on. How do you recognize the sections? With familiar kinds of music, this is pretty easy. (See the figure below for some examples of forms that will be familiar to most listeners ). With unfamiliar types of music, it can be more of a challenge, but it is still not difficult. Whether you are listening to classical, modern, jazz, or pop, there are important changes in the general sound and feel of the music when a new section begins. 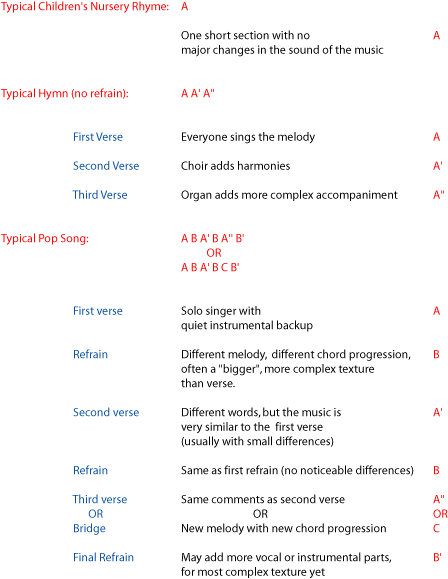 Also, many genres of music tend to follow a preset form, like the ” typical pop song form” in the figure above. A symphony, for example, is usually a piece of music written for a fairly large number of instruments. It is also associated with a particular form, so knowing that a piece of music is called a symphony will lead you to expect certain things about it. Note: Please note that there is some confusion about this: a symphony is not a large group of people who often play classical music together;that is an orchestra. The confusion occurs because many orchestras call themselves “symphony orchestras” because they spend so much time playing symphonies. If a piece of music is called a symphony, you might expect three or four (depending on when it was written) main sections, called movements. You’d expect a moment of silence in between movements, and you would expect each movement to sound very different; for example if the first movement is fast and loud, you might expect that the second movement would be slow and quiet. If you have heard many symphonies, you also would not be at all surprised if the first movement is in concerto form and the third movement is based on a dance. Other kinds of music are also so likely to follow a particular overall plan that they have become associated with a particular form. You can hear musicians talk about something being concerto form or sonata form, for example. 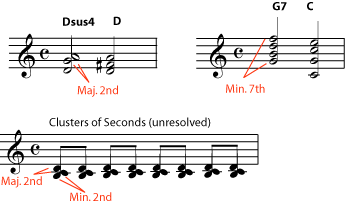 Particular dances (like a minuet, gigue, or waltz), besides having a set tempo and time signature, will often have a set form that suits the dance. And many marches are similar enough in form that there are names for the expected sections (first strain, second strain, trio, and so on). But it is important to remember that forms are not sets of rules that composers have to follow. Some symphonies don’t have silence between movements, some don’t use the concerto form in any of their movements, and Beethoven’s Ninth Symphony includes singers. 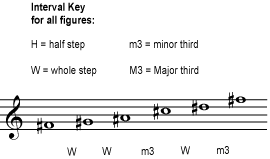 Plenty of marches have been written that don’t have a trio section, and the development section of a sonata movement can take unexpected turns. After all, in architecture, “house” form suggests to most Americans a front and back door, a dining room off the kitchen, and bedrooms with closets, but an architect is free to leave out the dining room, and put the main door at the side of the house and the closets in the bathrooms. Whether a piece of music is concerto form or sonata form, a theme and variations, or a rondo, the composer is always free to experiment with the overall architecture of the piece. Being able to spot that overall architecture as we listen – knowing, so to speak, which room we are in right now – gives us important clues that help us understand and appreciate the music.